This article will describe UFW. Enabling logging will output log to /var/log/ufw.log. Disabling logging is the following. The "ufw allow" allows port. Service name in /etc/services can be used. Some package provides the configuration file for UFW rule. Because there are packages which uses multiple port like samba, the configuration file for UFW rule is useful. The configuration files for UFW rule are in /etc/ufw/applications.d. "ufw app list" shows list. Use Available applications name for "ufw allow". Use "ufw deny" to deny port. "ufw status" shows list of allowed and denied ports. "ufw delete" deletes allowed and denied ports. Enabling UFW will deny all ports except for allowed ports. If OpenSSH is not allowed, next SSH session will be denied. This article uses yes command for accepting the following message. 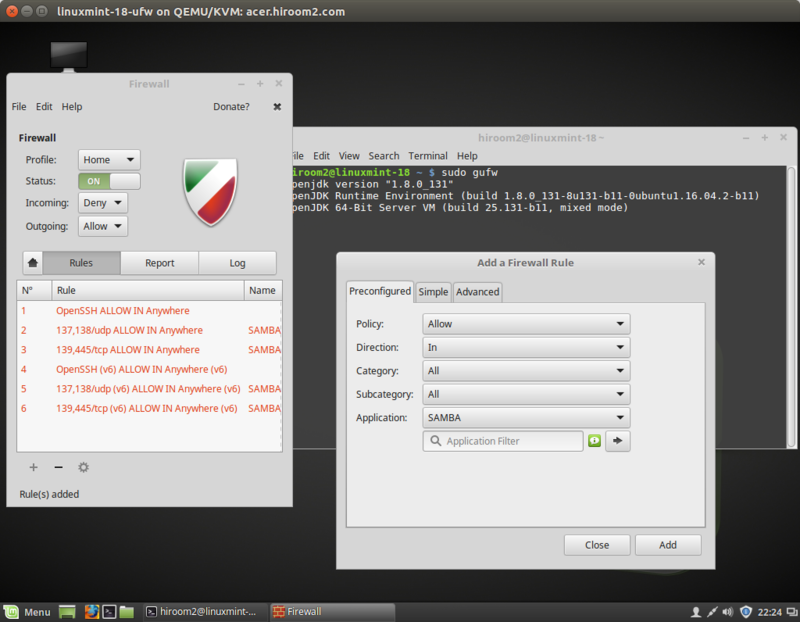 The gufw provides GUI interface for ufw. Run gufw with sudo. Because ufw is already enabled, Status is ON. Add rule with clicking "+" button at the Rules tab. Select application rule at the Preconfigured tab. SAMBA will allow 137,138/udp and 139,445/tcp. At the Simple tab, you can select port number to be allowed.